With vehicle details so we can help ensure this part fits your vehicle - we aim to respond within 2 working hours. Same day dispatch if ordered before 3:30pm! VW TRANSPORTER Mk5, Mk6, SG 2.0D Timing Belt & Water Pump Kit 2010 on Set Gates. Water Pump & Timing Belt Set. 530055031, KTBWP9490, 45116, KTBWP7880, KP15649XS1, VKMC011482, 530055032, VKMC01148-2. 530 0550 32, 530 0550 31. AUDI A1 (8X1, 8XK) 1.6 TDI. Model year to: 04/2015; Driven Units: Driven unit: camshaft; Part number of the recommended special tools: GAT4840; Part number of the recommended special tools: GAT4844. AUDI A1 (8X1, 8XK) 2.0 TDI. AUDI A1 Sportback (8XA, 8XF) 1.6 TDI. AUDI A1 Sportback (8XA, 8XF) 2.0 TDI. AUDI A3 (8P1) 1.6 TDI. Driven Units: Driven unit: camshaft; Part number of the recommended special tools: GAT4840; Part number of the recommended special tools: GAT4844. AUDI A3 (8P1) 2.0 TDI. Driven Units: Driven unit: camshaft; Engine Code: CFFA; Part number of the recommended special tools: GAT4840; Part number of the recommended special tools: GAT4844. Driven Units: Driven unit: camshaft; Engine Code: CFGB; Part number of the recommended special tools: GAT4840; Part number of the recommended special tools: GAT4844. AUDI A3 (8P1) 2.0 TDI 16V. Driven Units: Driven unit: camshaft; Engine Code: CFFB/CLJA; Part number of the recommended special tools: GAT4840; Part number of the recommended special tools: GAT4844. AUDI A3 (8P1) 2.0 TDI 16V quattro. Driven Units: Driven unit: camshaft; Engine Code: CFFB; Part number of the recommended special tools: GAT4840; Part number of the recommended special tools: GAT4844. AUDI A3 (8P1) 2.0 TDI quattro. AUDI A3 Convertible (8P7) 1.6 TDI. AUDI A3 Convertible (8P7) 2.0 TDI. AUDI A3 Sportback (8PA) 1.6 TDI. Model year to: 08/2012; Driven Units: Driven unit: camshaft; Part number of the recommended special tools: GAT4840; Part number of the recommended special tools: GAT4844. AUDI A3 Sportback (8PA) 2.0 TDI. AUDI A3 Sportback (8PA) 2.0 TDI 16V. AUDI A3 Sportback (8PA) 2.0 TDI 16V quattro. AUDI A3 Sportback (8PA) 2.0 TDI quattro. AUDI A4 (8K2, B8) 2.0 TDI. Driven Units: Driven unit: camshaft; Engine Code: CJCB; Part number of the recommended special tools: GAT4840; Part number of the recommended special tools: GAT4844; Part number of the recommended special tools: GAT4741. Driven Units: Driven unit: camshaft; Engine Code: CJCC; Part number of the recommended special tools: GAT4840; Part number of the recommended special tools: GAT4844; Part number of the recommended special tools: GAT4741. Driven Units: Driven unit: camshaft; Engine Code: CGLD; Part number of the recommended special tools: GAT4840; Part number of the recommended special tools: GAT4844; Part number of the recommended special tools: GAT4741. Driven Units: Driven unit: camshaft; Part number of the recommended special tools: GAT4840; Part number of the recommended special tools: GAT4844; Part number of the recommended special tools: GAT4741. Driven Units: Driven unit: camshaft; Engine Code: CJCA/CMFA; Part number of the recommended special tools: GAT4840; Part number of the recommended special tools: GAT4844; Part number of the recommended special tools: GAT4741. Driven Units: Driven unit: camshaft; Engine Code: CJCD/CMFB; Part number of the recommended special tools: GAT4840; Part number of the recommended special tools: GAT4844; Part number of the recommended special tools: GAT4741. AUDI A4 (8K2, B8) 2.0 TDI quattro. Model year from: 05/2009; Driven Units: Driven unit: camshaft; Engine Code: CJCA; Part number of the recommended special tools: GAT4840; Part number of the recommended special tools: GAT4844; Part number of the recommended special tools: GAT4741. Driven Units: Driven unit: camshaft; Engine Code: CJCD; Part number of the recommended special tools: GAT4840; Part number of the recommended special tools: GAT4844; Part number of the recommended special tools: GAT4741. AUDI A4 Allroad (8KH, B8) 2.0 TDI quattro. Driven Units: Driven unit: camshaft; Engine Code: CJCA; Part number of the recommended special tools: GAT4840; Part number of the recommended special tools: GAT4844; Part number of the recommended special tools: GAT4741. Type: A4 Allroad Quattro; Driven Units: Driven unit: camshaft; Engine Code: CJCD; Part number of the recommended special tools: GAT4840; Part number of the recommended special tools: GAT4844; Part number of the recommended special tools: GAT4741. AUDI A4 Avant (8K5, B8) 2.0 TDI. AUDI A4 Avant (8K5, B8) 2.0 TDI quattro. Type: A4 Allroad Quattro; Driven Units: Driven unit: camshaft; Engine Code: CJCD; Part number of the recommended special tools: GAT4840; Part number of the recommended special tools: GAT4844; Part number of the recommended special tools: GAT4741; or; Type: A4 Quattro; Driven Units: Driven unit: camshaft; Engine Code: CJCD; Part number of the recommended special tools: GAT4840; Part number of the recommended special tools: GAT4844; Part number of the recommended special tools: GAT4741. Model year from: 11/2008; Driven Units: Driven unit: camshaft; Engine Code: CJCA; Part number of the recommended special tools: GAT4840; Part number of the recommended special tools: GAT4844; Part number of the recommended special tools: GAT4741. AUDI A5 (8T3) 2.0 TDI. AUDI A5 (8T3) 2.0 TDI quattro. AUDI A5 Convertible (8F7) 2.0 TDI. AUDI A5 Convertible (8F7) 2.0 TDI quattro. AUDI A5 Sportback (8TA) 2.0 TDI. Model year to: 05/2013; Driven Units: Driven unit: camshaft; Engine Code: CJCA/CMFA; Part number of the recommended special tools: GAT4840; Part number of the recommended special tools: GAT4844; Part number of the recommended special tools: GAT4741. AUDI A5 Sportback (8TA) 2.0 TDI quattro. AUDI A6 (4G2, 4GC, C7) 2.0 TDI. Model year to: 04/2015; Driven Units: Driven unit: camshaft; Part number of the recommended special tools: GAT4840; Part number of the recommended special tools: GAT4844; Part number of the recommended special tools: GAT4741. AUDI Q5 (8RB) 2.0 TDI quattro. Driven Units: Driven unit: camshaft; Engine Code: CGLA; Part number of the recommended special tools: GAT4840; Part number of the recommended special tools: GAT4844; Part number of the recommended special tools: GAT4741. Model year to: 09/2012; Driven Units: Driven unit: camshaft; Engine Code: CGLB/CMGA; Part number of the recommended special tools: GAT4840; Part number of the recommended special tools: GAT4844; Part number of the recommended special tools: GAT4741. AUDI TT (8J3) 2.0 TDI quattro. AUDI TT Roadster (8J9) 2.0 TDI quattro. SEAT ALHAMBRA (710, 711) 2.0 TDI. Model year to: 02/2013; Driven Units: Driven unit: camshaft; Part number of the recommended special tools: GAT4840; Part number of the recommended special tools: GAT4844. Driven Units: Driven unit: camshaft; Engine Code: CFFE; Part number of the recommended special tools: GAT4840; Part number of the recommended special tools: GAT4844. SEAT ALHAMBRA (710, 711) 2.0 TDI 4Drive. SEAT ALTEA (5P1) 1.6 TDI. SEAT ALTEA (5P1) 2.0 TDI 16V. Driven Units: Driven unit: camshaft; Engine Code: CFHC; Part number of the recommended special tools: GAT4840; Part number of the recommended special tools: GAT4844. SEAT ALTEA XL (5P5, 5P8) 1.6 TDI. Type: Altea XL; Driven Units: Driven unit: camshaft; Part number of the recommended special tools: GAT4840; Part number of the recommended special tools: GAT4844; or; Model year from: 02/2010; Type: Altea Freetrack; Driven Units: Driven unit: camshaft; Part number of the recommended special tools: GAT4840; Part number of the recommended special tools: GAT4844. SEAT ALTEA XL (5P5, 5P8) 2.0 TDI 16V. SEAT ALTEA XL (5P5, 5P8) 2.0 TDI 16V 4x4. Type: Altea Freetrack; Driven Units: Driven unit: camshaft; Part number of the recommended special tools: GAT4840; Part number of the recommended special tools: GAT4844; or; Type: Altea XL; Driven Units: Driven unit: camshaft; Part number of the recommended special tools: GAT4840; Part number of the recommended special tools: GAT4844. SEAT ALTEA XL (5P5, 5P8) 2.0 TDI 4x4. Model year from: 11/2010; Model year to: 06/2013; Type: Altea Freetrack; Driven Units: Driven unit: camshaft; Engine Code: CFJA; Part number of the recommended special tools: GAT4840; Part number of the recommended special tools: GAT4844. SEAT EXEO (3R2) 2.0 TDI. Driven Units: Driven unit: camshaft; Engine Code: CGLB; Part number of the recommended special tools: GAT4840; Part number of the recommended special tools: GAT4844; Part number of the recommended special tools: GAT4741. SEAT EXEO ST (3R5) 2.0 TDI. SEAT IBIZA Mk IV (6J5, 6P1) 1.2 TDI. SEAT IBIZA Mk IV (6J5, 6P1) 1.6 TDI. SEAT IBIZA Mk IV (6J5, 6P1) 2.0 TDI. SEAT IBIZA Mk IV SPORTCOUPE (6J1, 6P5) 1.2 TDI. SEAT IBIZA Mk IV SPORTCOUPE (6J1, 6P5) 1.6 TDI. SEAT IBIZA Mk IV SPORTCOUPE (6J1, 6P5) 2.0 TDI. SEAT IBIZA Mk IV ST (6J8, 6P8) 1.2 TDI. SEAT IBIZA Mk IV ST (6J8, 6P8) 1.6 TDI. SEAT LEON (1P1) 1.6 TDI. SEAT LEON (1P1) 2.0 TDI. Driven Units: Driven unit: camshaft; Engine Code: CFJA; Part number of the recommended special tools: GAT4840; Part number of the recommended special tools: GAT4844. SEAT LEON (1P1) 2.0 TDI 16V. Driven Units: Driven unit: camshaft; Engine Code: CFHC/CLCB; Part number of the recommended special tools: GAT4840; Part number of the recommended special tools: GAT4844. SEAT TOLEDO IV (KG3) 1.6 TDI. Model year to: 06/2015; Driven Units: Driven unit: camshaft; Part number of the recommended special tools: GAT4840; Part number of the recommended special tools: GAT4844. SKODA FABIA II (542) 1.2 TDI. SKODA FABIA II (542) 1.6 TDI. Type: Fabia; Driven Units: Driven unit: camshaft; Part number of the recommended special tools: GAT4840; Part number of the recommended special tools: GAT4844; or; Type: Fabia Scout; Driven Units: Driven unit: camshaft; Part number of the recommended special tools: GAT4840; Part number of the recommended special tools: GAT4844. SKODA FABIA II Combi (545) 1.2 TDI. SKODA FABIA II Combi (545) 1.6 TDI. SKODA OCTAVIA II (1Z3) 1.6 TDI. SKODA OCTAVIA II (1Z3) 2.0 TDI. Model year to: 03/2013; Driven Units: Driven unit: camshaft; Part number of the recommended special tools: GAT4840; Part number of the recommended special tools: GAT4844. SKODA OCTAVIA II (1Z3) 2.0 TDI 16V. SKODA OCTAVIA II Combi (1Z5) 1.6 TDI. SKODA OCTAVIA II Combi (1Z5) 1.6 TDI 4x4. SKODA OCTAVIA II Combi (1Z5) 2.0 TDI. SKODA OCTAVIA II Combi (1Z5) 2.0 TDI 16V. SKODA OCTAVIA II Combi (1Z5) 2.0 TDI 16V 4x4. Type: Octavia; Driven Units: Driven unit: camshaft; Part number of the recommended special tools: GAT4840; Part number of the recommended special tools: GAT4844. Also fits:- ;Type: Octavia Scout; Driven Units: Driven unit: camshaft; Engine Code: CFHC/CLCB; Part number of the recommended special tools: GAT4840; Part number of the recommended special tools: GAT4844. SKODA OCTAVIA II Combi (1Z5) 2.0 TDI 4x4. SKODA SUPERB II (3T4) 1.6 TDI. SKODA SUPERB II (3T4) 2.0 TDI. Driven Units: Driven unit: camshaft; Engine Code: CFGB; Part number of the recommended special tools: GAT4840; Part number of the recommended special tools: GAT4844; Part number of the recommended special tools: GAT4741. SKODA SUPERB II (3T4) 2.0 TDI 16V. Driven Units: Driven unit: camshaft; Engine Code: CFFB/CLJA; Part number of the recommended special tools: GAT4840; Part number of the recommended special tools: GAT4844; Part number of the recommended special tools: GAT4741. SKODA SUPERB II (3T4) 2.0 TDI 16V 4x4. SKODA SUPERB II (3T4) 2.0 TDI 4x4. SKODA SUPERB II Estate (3T5) 1.6 TDI. SKODA SUPERB II Estate (3T5) 2.0 TDI 4x4. SKODA YETI (5L) 1.6 TDI. SKODA YETI (5L) 2.0 TDI. Driven Units: Driven unit: camshaft; Engine Code: CFHA; Part number of the recommended special tools: GAT4840; Part number of the recommended special tools: GAT4844. SKODA YETI (5L) 2.0 TDI 4x4. Driven Units: Driven unit: camshaft; Engine Code: CFHF; Part number of the recommended special tools: GAT4840; Part number of the recommended special tools: GAT4844. Model year from: 11/2010; Driven Units: Driven unit: camshaft; Engine Code: CFJA; Part number of the recommended special tools: GAT4840; Part number of the recommended special tools: GAT4844. VW AMAROK (2HA, 2HB, S1B, S6B, S7A, S7B) 2.0 BiTDI. VW AMAROK (2HA, 2HB, S1B, S6B, S7A, S7B) 2.0 BiTDI 4motion. Model year from: 05/2012; Driven Units: Driven unit: camshaft; Part number of the recommended special tools: GAT4840; Part number of the recommended special tools: GAT4844. Model year from: 06/2012; Driven Units: Driven unit: camshaft; Part number of the recommended special tools: GAT4840; Part number of the recommended special tools: GAT4844. VW AMAROK Platform/Chassis (S1B) 2.0 TDI 4motion. VW BEETLE (5C1, 5C2) 1.6 TDI. Model year to: 07/2016; Driven Units: Driven unit: camshaft; Part number of the recommended special tools: GAT4840; Part number of the recommended special tools: GAT4844. VW BEETLE (5C1, 5C2) 2.0 TDI. Model year to: 07/2016; Driven Units: Driven unit: camshaft; Engine Code: CFFB; Part number of the recommended special tools: GAT4840; Part number of the recommended special tools: GAT4844. VW BEETLE Convertible (5C7, 5C8) 1.6 TDI. Model year from: 09/2012; Model year to: 07/2016; Driven Units: Driven unit: camshaft; Part number of the recommended special tools: GAT4840; Part number of the recommended special tools: GAT4844. VW BEETLE Convertible (5C7, 5C8) 2.0 TDI. VW CADDY III Box (2KA, 2KH, 2CA, 2CH) 1.6 TDI. Type: Caddy; Driven Units: Driven unit: camshaft; Part number of the recommended special tools: GAT4840; Part number of the recommended special tools: GAT4844; or; Type: Caddy Maxi; Driven Units: Driven unit: camshaft; Part number of the recommended special tools: GAT4840; Part number of the recommended special tools: GAT4844. VW CADDY III Box (2KA, 2KH, 2CA, 2CH) 2.0 TDI. Type: Caddy Maxi; Driven Units: Driven unit: camshaft; Part number of the recommended special tools: GAT4840; Part number of the recommended special tools: GAT4844; or; Type: Caddy; Driven Units: Driven unit: camshaft; Part number of the recommended special tools: GAT4840; Part number of the recommended special tools: GAT4844. VW CADDY III Box (2KA, 2KH, 2CA, 2CH) 2.0 TDI 16V. VW CADDY III Estate (2KB, 2KJ, 2CB, 2CJ) 2.0 TDI 16V. VW CADDY III Estate (2KB, 2KJ, 2CB, 2CJ) 2.0 TDI 16V 4motion. VW CADDY III Estate (2KB, 2KJ, 2CB, 2CJ) 2.0 TDI 4motion. VW CADDY IV Box (SAA, SAH) 1.6 TDI. Type: Caddy Maxi; Driven Units: Driven unit: camshaft; Part number of the recommended special tools: GAT4840; Part number of the recommended special tools: GAT4844; or; Type: Caddy Alltrack; Driven Units: Driven unit: camshaft; Part number of the recommended special tools: GAT4840; Part number of the recommended special tools: GAT4844; or; Type: Caddy; Driven Units: Driven unit: camshaft; Part number of the recommended special tools: GAT4840; Part number of the recommended special tools: GAT4844. VW CADDY IV Box (SAA, SAH) 2.0 TDI. VW CADDY IV Box (SAA, SAH) 2.0 TDI 4motion. VW CADDY IV Estate (SAB, SAJ) 1.6 TDI. Type: Caddy Alltrack; Driven Units: Driven unit: camshaft; Part number of the recommended special tools: GAT4840; Part number of the recommended special tools: GAT4844; or; Type: Caddy; Driven Units: Driven unit: camshaft; Part number of the recommended special tools: GAT4840; Part number of the recommended special tools: GAT4844. VW CADDY IV Estate (SAB, SAJ) 2.0 TDI. VW CADDY IV Estate (SAB, SAJ) 2.0 TDI 4motion. VW CC (358) 2.0 TDI. VW CC (358) 2.0 TDI 4motion. VW CRAFTER 30-35 Bus (2E_) 2.0 TDI. Type: Crafter 30; Driven Units: Driven unit: camshaft; Part number of the recommended special tools: GAT4840; Part number of the recommended special tools: GAT4844; or; Type: Crafter 32; Driven Units: Driven unit: camshaft; Part number of the recommended special tools: GAT4840; Part number of the recommended special tools: GAT4844; or; Type: Crafter 35; Driven Units: Driven unit: camshaft; Part number of the recommended special tools: GAT4840; Part number of the recommended special tools: GAT4844. Type: Crafter 35; Driven Units: Driven unit: camshaft; Part number of the recommended special tools: GAT4840; Part number of the recommended special tools: GAT4844; or; Type: Crafter 30; Driven Units: Driven unit: camshaft; Part number of the recommended special tools: GAT4840; Part number of the recommended special tools: GAT4844; or; Type: Crafter 32; Driven Units: Driven unit: camshaft; Part number of the recommended special tools: GAT4840; Part number of the recommended special tools: GAT4844. VW CRAFTER 30-35 Bus (2E_) 2.0 TDI 4motion. VW CRAFTER 30-50 Box (2E_) 2.0 TDI. Type: Crafter 35; Driven Units: Driven unit: camshaft; Part number of the recommended special tools: GAT4840; Part number of the recommended special tools: GAT4844; or; Type: Crafter 50; Driven Units: Driven unit: camshaft; Part number of the recommended special tools: GAT4840; Part number of the recommended special tools: GAT4844; or; Type: Crafter 32; Driven Units: Driven unit: camshaft; Part number of the recommended special tools: GAT4840; Part number of the recommended special tools: GAT4844; or; Type: Crafter 46; Driven Units: Driven unit: camshaft; Part number of the recommended special tools: GAT4840; Part number of the recommended special tools: GAT4844; or; Type: Crafter 30; Driven Units: Driven unit: camshaft; Part number of the recommended special tools: GAT4840; Part number of the recommended special tools: GAT4844. VW CRAFTER 30-50 Box (2E_) 2.0 TDI 4motion. VW CRAFTER 30-50 Platform/Chassis (2F_) 2.0 TDI. VW GOLF PLUS (5M1, 521) 2.0 TDI 16V. VW GOLF V (1K1) 2.5. VW GOLF VI (5K1) 1.6 TDI. VW GOLF VI (5K1) 2.0 TDI. Model year to: 11/2012; Driven Units: Driven unit: camshaft; Engine Code: CFFB; Part number of the recommended special tools: GAT4840; Part number of the recommended special tools: GAT4844. VW GOLF VI (5K1) 2.0 TDI 4motion. VW GOLF VI Convertible (517) 1.6 TDI. Model year to: 05/2016; Driven Units: Driven unit: camshaft; Part number of the recommended special tools: GAT4840; Part number of the recommended special tools: GAT4844. VW GOLF VI Convertible (517) 2.0 TDI. VW GOLF VI Estate (AJ5) 1.6 TDI. VW GOLF VI Estate (AJ5) 1.6 TDI 4motion. VW GOLF VI Estate (AJ5) 2.0 TDI. VW JETTA III (1K2) 1.6 TDI. VW JETTA IV (162, 163) 1.6 TDI. Model year from: 11/2010; Driven Units: Driven unit: camshaft; Part number of the recommended special tools: GAT4840; Part number of the recommended special tools: GAT4844. VW JETTA IV (162, 163) 2.0 TDI. Driven Units: Driven unit: camshaft; Engine Code: CJCD; Part number of the recommended special tools: GAT4840; Part number of the recommended special tools: GAT4844. VW MULTIVAN Mk V (7HM, 7HN, 7HF, 7EF, 7EM, 7EN) 2.0 BiTDI. VW MULTIVAN Mk V (7HM, 7HN, 7HF, 7EF, 7EM, 7EN) 2.0 BiTDI 4motion. Model year from: 01/2010; Driven Units: Driven unit: camshaft; Part number of the recommended special tools: GAT4840; Part number of the recommended special tools: GAT4844. VW MULTIVAN Mk V (7HM, 7HN, 7HF, 7EF, 7EM, 7EN) 2.0 TDI. VW PASSAT (362) 1.6 TDI. VW PASSAT (362) 2.0 TDI. VW PASSAT (362) 2.0 TDI 4motion. Model year from: 11/2010; Driven Units: Driven unit: camshaft; Part number of the recommended special tools: GAT4840; Part number of the recommended special tools: GAT4844; Part number of the recommended special tools: GAT4741. VW PASSAT (3C2) 1.6 TDI. VW PASSAT ALLTRACK (365) 2.0 TDI. VW PASSAT ALLTRACK (365) 2.0 TDI 4motion. Model year to: 01/2013; Driven Units: Driven unit: camshaft; Part number of the recommended special tools: GAT4840; Part number of the recommended special tools: GAT4844; Part number of the recommended special tools: GAT4741. VW PASSAT CC (357) 2.0 TDI. Driven Units: Driven unit: camshaft; Engine Code: CFGB/CLLA; Part number of the recommended special tools: GAT4840; Part number of the recommended special tools: GAT4844; Part number of the recommended special tools: GAT4741. Driven Units: Driven unit: camshaft; Engine Code: CFFB; Part number of the recommended special tools: GAT4840; Part number of the recommended special tools: GAT4844; Part number of the recommended special tools: GAT4741. Driven Units: Driven unit: camshaft; Engine Code: CFFA; Part number of the recommended special tools: GAT4840; Part number of the recommended special tools: GAT4844; Part number of the recommended special tools: GAT4741. VW PASSAT CC (357) 2.0 TDI 4motion. VW PASSAT Estate (365) 1.6 TDI. VW PASSAT Estate (365) 2.0 TDI. VW PASSAT Estate (365) 2.0 TDI 4motion. VW PASSAT Estate (3C5) 1.6 TDI. VW POLO (6R1, 6C1) 1.2 TDI. Model year to: 05/2014; Driven Units: Driven unit: camshaft; Part number of the recommended special tools: GAT4840; Part number of the recommended special tools: GAT4844. VW POLO (6R1, 6C1) 1.6 TDI. VW SCIROCCO (137, 138) 2.0 TDI. Model year to: 11/2013; Driven Units: Driven unit: camshaft; Part number of the recommended special tools: GAT4840; Part number of the recommended special tools: GAT4844. Model year to: 05/2014; Driven Units: Driven unit: camshaft; Engine Code: CFGB; Part number of the recommended special tools: GAT4840; Part number of the recommended special tools: GAT4844. Model year to: 05/2014; Driven Units: Driven unit: camshaft; Engine Code: CFHC; Part number of the recommended special tools: GAT4840; Part number of the recommended special tools: GAT4844. VW SHARAN (7N1, 7N2) 2.0 TDI. Model year to: 11/2015; Driven Units: Driven unit: camshaft; Part number of the recommended special tools: GAT4840; Part number of the recommended special tools: GAT4844. Model year to: 01/2013; Driven Units: Driven unit: camshaft; Part number of the recommended special tools: GAT4840; Part number of the recommended special tools: GAT4844. VW SHARAN (7N1, 7N2) 2.0 TDI 4motion. VW TIGUAN (5N_) 2.0 TDI. VW TOURAN (1T3) 1.6 TDI. VW TOURAN (1T3) 2.0 TDI. VW TRANSPORTER / CARAVELLE Mk V Bus 7HB, 7HJ, 7EB, 7EJ, 7EF, 7 2.0 BiTDI. Type: Transporter; Driven Units: Driven unit: camshaft; Part number of the recommended special tools: GAT4840; Part number of the recommended special tools: GAT4844; or; Model year from: 05/2011; Type: Transporter Shuttle; Driven Units: Driven unit: camshaft; Part number of the recommended special tools: GAT4840; Part number of the recommended special tools: GAT4844; or; Type: Caravelle; Driven Units: Driven unit: camshaft; Part number of the recommended special tools: GAT4840; Part number of the recommended special tools: GAT4844; or; Type: California; Driven Units: Driven unit: camshaft; Part number of the recommended special tools: GAT4840; Part number of the recommended special tools: GAT4844; or; Type: Campmobile; Driven Units: Driven unit: camshaft; Part number of the recommended special tools: GAT4840; Part number of the recommended special tools: GAT4844. VW TRANSPORTER / CARAVELLE Mk V Bus 7HB, 7HJ, 7EB, 7EJ, 7EF, 7 2.0 BiTDI 4motion. Model year from: 01/2010; Type: Transporter; Driven Units: Driven unit: camshaft; Part number of the recommended special tools: GAT4840; Part number of the recommended special tools: GAT4844; or; Model year from: 05/2011; Type: Transporter Shuttle; Driven Units: Driven unit: camshaft; Part number of the recommended special tools: GAT4840; Part number of the recommended special tools: GAT4844; or; Model year from: 01/2010; Type: Caravelle; Driven Units: Driven unit: camshaft; Part number of the recommended special tools: GAT4840; Part number of the recommended special tools: GAT4844; or; Model year from: 01/2010; Type: California; Driven Units: Driven unit: camshaft; Part number of the recommended special tools: GAT4840; Part number of the recommended special tools: GAT4844; or; Model year from: 01/2010; Type: Campmobile; Driven Units: Driven unit: camshaft; Part number of the recommended special tools: GAT4840; Part number of the recommended special tools: GAT4844. VW TRANSPORTER / CARAVELLE Mk V Bus 7HB, 7HJ, 7EB, 7EJ, 7EF, 7 2.0 TDI. Type: Transporter; Driven Units: Driven unit: camshaft; Part number of the recommended special tools: GAT4840; Part number of the recommended special tools: GAT4844; or; Type: Caravelle; Driven Units: Driven unit: camshaft; Part number of the recommended special tools: GAT4840; Part number of the recommended special tools: GAT4844; or; Type: California; Driven Units: Driven unit: camshaft; Part number of the recommended special tools: GAT4840; Part number of the recommended special tools: GAT4844; or; Type: Campmobile; Driven Units: Driven unit: camshaft; Part number of the recommended special tools: GAT4840; Part number of the recommended special tools: GAT4844. Type: Transporter; Driven Units: Driven unit: camshaft; Part number of the recommended special tools: GAT4840; Part number of the recommended special tools: GAT4844; or; Type: Transporter Shuttle; Driven Units: Driven unit: camshaft; Part number of the recommended special tools: GAT4840; Part number of the recommended special tools: GAT4844; or; Type: Caravelle; Driven Units: Driven unit: camshaft; Part number of the recommended special tools: GAT4840; Part number of the recommended special tools: GAT4844; or; Type: California; Driven Units: Driven unit: camshaft; Part number of the recommended special tools: GAT4840; Part number of the recommended special tools: GAT4844. Model year from: 04/2011; Type: Transporter; Driven Units: Driven unit: camshaft; Part number of the recommended special tools: GAT4840; Part number of the recommended special tools: GAT4844; or; Type: Caravelle; Driven Units: Driven unit: camshaft; Part number of the recommended special tools: GAT4840; Part number of the recommended special tools: GAT4844; or; Type: California; Driven Units: Driven unit: camshaft; Part number of the recommended special tools: GAT4840; Part number of the recommended special tools: GAT4844; or; Type: Transporter Shuttle; Driven Units: Driven unit: camshaft; Part number of the recommended special tools: GAT4840; Part number of the recommended special tools: GAT4844; or; Type: Campmobile; Driven Units: Driven unit: camshaft; Part number of the recommended special tools: GAT4840; Part number of the recommended special tools: GAT4844. Type: Caravelle; Driven Units: Driven unit: camshaft; Part number of the recommended special tools: GAT4840; Part number of the recommended special tools: GAT4844; or; Type: Transporter; Driven Units: Driven unit: camshaft; Part number of the recommended special tools: GAT4840; Part number of the recommended special tools: GAT4844; or; Type: Transporter Shuttle; Driven Units: Driven unit: camshaft; Part number of the recommended special tools: GAT4840; Part number of the recommended special tools: GAT4844; or; Type: California; Driven Units: Driven unit: camshaft; Part number of the recommended special tools: GAT4840; Part number of the recommended special tools: GAT4844; or; Type: Campmobile; Driven Units: Driven unit: camshaft; Part number of the recommended special tools: GAT4840; Part number of the recommended special tools: GAT4844. VW TRANSPORTER / CARAVELLE Mk V Bus 7HB, 7HJ, 7EB, 7EJ, 7EF, 7 2.0 TDI 4motion. Type: Transporter; Driven Units: Driven unit: camshaft; Part number of the recommended special tools: GAT4840; Part number of the recommended special tools: GAT4844; or; Type: Caravelle; Driven Units: Driven unit: camshaft; Part number of the recommended special tools: GAT4840; Part number of the recommended special tools: GAT4844; or; Type: California; Driven Units: Driven unit: camshaft; Part number of the recommended special tools: GAT4840; Part number of the recommended special tools: GAT4844. Type: Transporter; Driven Units: Driven unit: camshaft; Part number of the recommended special tools: GAT4840; Part number of the recommended special tools: GAT4844; or; Type: Transporter Shuttle; Driven Units: Driven unit: camshaft; Part number of the recommended special tools: GAT4840; Part number of the recommended special tools: GAT4844; or; Type: Caravelle; Driven Units: Driven unit: camshaft; Part number of the recommended special tools: GAT4840; Part number of the recommended special tools: GAT4844; or; Type: California; Driven Units: Driven unit: camshaft; Part number of the recommended special tools: GAT4840; Part number of the recommended special tools: GAT4844; or; Type: Campmobile; Driven Units: Driven unit: camshaft; Part number of the recommended special tools: GAT4840; Part number of the recommended special tools: GAT4844. VW TRANSPORTER / CARAVELLE Mk VI Bus (SGB, SGG, SGJ) 2.0 TDI. Type: California; Driven Units: Driven unit: camshaft; Part number of the recommended special tools: GAT4840; Part number of the recommended special tools: GAT4844; or; Type: Caravelle; Driven Units: Driven unit: camshaft; Part number of the recommended special tools: GAT4840; Part number of the recommended special tools: GAT4844; or; Type: Transporter; Driven Units: Driven unit: camshaft; Part number of the recommended special tools: GAT4840; Part number of the recommended special tools: GAT4844. Type: Transporter; Driven Units: Driven unit: camshaft; Engine Code: CAAA; Part number of the recommended special tools: GAT4840; Part number of the recommended special tools: GAT4844; or; Type: Caravelle; Driven Units: Driven unit: camshaft; Engine Code: CAAA; Part number of the recommended special tools: GAT4840; Part number of the recommended special tools: GAT4844. Type: Caravelle; Driven Units: Driven unit: camshaft; Part number of the recommended special tools: GAT4840; Part number of the recommended special tools: GAT4844; or; Type: California; Driven Units: Driven unit: camshaft; Part number of the recommended special tools: GAT4840; Part number of the recommended special tools: GAT4844; or; Type: Transporter; Driven Units: Driven unit: camshaft; Part number of the recommended special tools: GAT4840; Part number of the recommended special tools: GAT4844. Type: California; Driven Units: Driven unit: camshaft; Engine Code: CAAB; Part number of the recommended special tools: GAT4840; Part number of the recommended special tools: GAT4844; or; Type: Caravelle; Driven Units: Driven unit: camshaft; Engine Code: CAAB; Part number of the recommended special tools: GAT4840; Part number of the recommended special tools: GAT4844; or; Type: Transporter; Driven Units: Driven unit: camshaft; Engine Code: CAAB; Part number of the recommended special tools: GAT4840; Part number of the recommended special tools: GAT4844. VW TRANSPORTER / CARAVELLE Mk VI Bus (SGB, SGG, SGJ) 2.0 TDI 4motion. VW TRANSPORTER Mk V Box (7HA, 7HH, 7EA, 7EH) 2.0 BiTDI. VW TRANSPORTER Mk V Box (7HA, 7HH, 7EA, 7EH) 2.0 BiTDI 4motion. VW TRANSPORTER Mk V Box (7HA, 7HH, 7EA, 7EH) 2.0 TDI. Type: Transporter; Driven Units: Driven unit: camshaft; Part number of the recommended special tools: GAT4840; Part number of the recommended special tools: GAT4844; or; Model year from: 01/2010; Type: Kombi; Driven Units: Driven unit: camshaft; Part number of the recommended special tools: GAT4840; Part number of the recommended special tools: GAT4844. VW TRANSPORTER Mk V Box (7HA, 7HH, 7EA, 7EH) 2.0 TDI 4motion. VW TRANSPORTER Mk V Platform/Chassis 7JD, 7JE, 7JL, 7JY, 7JZ, 2.0 BiTDI. VW TRANSPORTER Mk V Platform/Chassis 7JD, 7JE, 7JL, 7JY, 7JZ, 2.0 BiTDI 4motion. VW TRANSPORTER Mk V Platform/Chassis 7JD, 7JE, 7JL, 7JY, 7JZ, 2.0 TDI. VW TRANSPORTER Mk V Platform/Chassis 7JD, 7JE, 7JL, 7JY, 7JZ, 2.0 TDI 4motion. VW TRANSPORTER Mk VI Box (SGA, SGH) 2.0 TDI. Driven Units: Driven unit: camshaft; Engine Code: CAAA; Part number of the recommended special tools: GAT4840; Part number of the recommended special tools: GAT4844. VW TRANSPORTER Mk VI Box (SGA, SGH) 2.0 TDI 4motion. VW TRANSPORTER Mk VI Platform/Chassis (SFD, SFE, SFL, SFZ) 2.0 TDI. VW TRANSPORTER Mk VI Platform/Chassis (SFD, SFE, SFL, SFZ) 2.0 TDI 4motion. As an engineering leader with a strong foundation in research and development, Gates is committed to advancing the science of motion performance by developing safe, forward-thinking products, services, systems, and solutions, as well as fostering long-term customer and employee relationships. Headquartered in Denver, Colorado, Gates employs over 14,000 people across 106 locations in 30 countries. If it moves you, there's a good chance Gates has a part in it. We sell our products globally under the Gates brand, which is recognized by distributors, original equipment manufacturers, and installers as the premium brand for quality and technological innovation, a reputation which we have built for over a century since our founding in 1911. 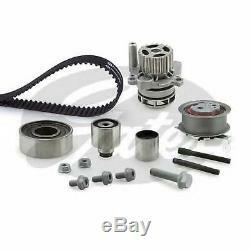 The item "VW TRANSPORTER Mk5, Mk6, SG 2.0D Timing Belt & Water Pump Kit 2010 on Set Gates" is in sale since Tuesday, July 18, 2017. This item is in the category "Vehicle Parts & Accessories\Car Parts\Engines & Engine Parts\Belt, Pulley & Tensioner Kits". The seller is "carpartsinmotion" and is located in Leeds, United Kingdom. This item can be shipped to all countries in Europe, Saudi arabia, South africa, United arab emirates, Chile.